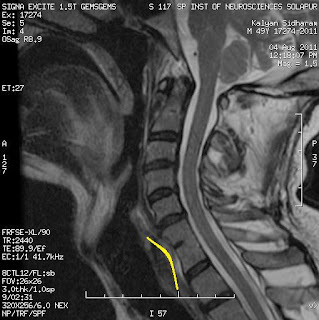 MRI Cervical spine mid sagittal T2 section shows a congenital fusion of C6-7 with rudimentary intervening intervertebral disc – ‘Wasp-waist’ sign. A radiographic appearance seen in congenital fusion of the vertebral bodies. Importance of this sign is to differentiate congenital from acquired fusion secondary to infection spondylodiscitis or surgery. The antero posterior diameter at the level of the affected disco vertebral joint is smaller than the diameters at the superior and inferior limits of the vertebrae adjacent to the uninvolved discs. 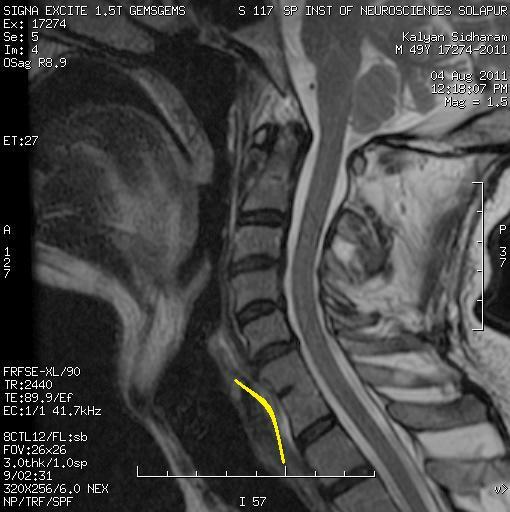 Fused vertebrae form a continuous surface with concavity anteriorly. The term 'Wasp waist' refers to a woman's fashion silhouette, produced by a style of corset and girdle was very popular in 19th and 20th centuries. Its primary feature is the abrupt transition from a natural-width rib cage to an exceedingly small waist, with the hips curving out below. The sharply cinched waistline also exaggerates the hips and bust. To achieve these drastic measurements women suffered with cracked and deformed ribs, weakened abdominal muscles deformed and dislocated internal organs, and respiratory ailments. Displacement and disfigurement of the reproductive organs greatly increased the risk of miscarriage.